Very easy to cook item. Children will love this. Similar to egg. So cooked along with egg to increase the quantity. Little bit sweet in taste. So those who want it to be hot can add chili powder to the recipe. 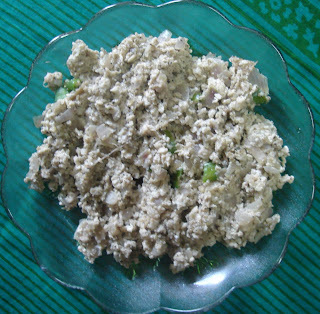 This is made just like scrambled egg. Chop the onions and the chili. Break the eggs and beat it a little. Add the brain into the egg and mix it well. I always use my hand to smash the brain and mix it nicely into the egg so that it gets mixed well. Add the pepper powder also into this. 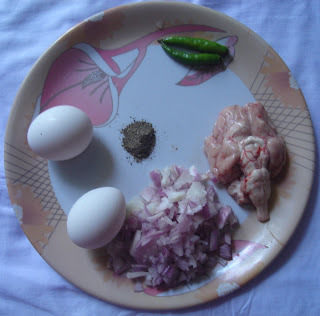 In a kadai in one teaspoon of oil sauté the onions and the chili and once it is sauted, add the egg brain mix and stir continuously. The whole thing will turn like egg scramble. Those who want the fry to be hot can add little bit chili powder into the egg brain mix. Brain will get cooked fast. So the cooking time will just be 5 to 6 minutes in low fire.